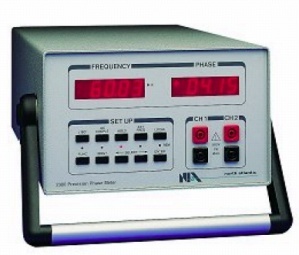 Wide Frequency range from 0.01 Hz to 700 kHz Accuracy ±0.1% (NIST traceable) Sensitivity from 0.001 Vpk to 500 Vpk Size: 8.5" W x 5.7" H x 15.4" D (215mm x 144mm x 390mm)Phase measurements to ±0.02_ can be made on signals with over 200% total harmonic distortion (THD) - distortion over twice as high as the signal itself. Likewise the unit is unaffected by noise 100 times as great as the signal itself. Such noise usually completely masks the signal on an oscilloscope and makes phase measurements impossible usingtraditional zero-crossing analog techniques.